The Heat Factory warmer is a soft, lightweight pouch containing a biodegradable mixture of iron powder, charcoal, salt, sawdust and vermiculite. When exposed to the air, an oxidation process takes place that generates heat. Unopened, the Heat Factory Warmers have a shelf life of three years or more. To find out more on instructional use, components, and the process itself, please visit Heat Factory’s informational page. 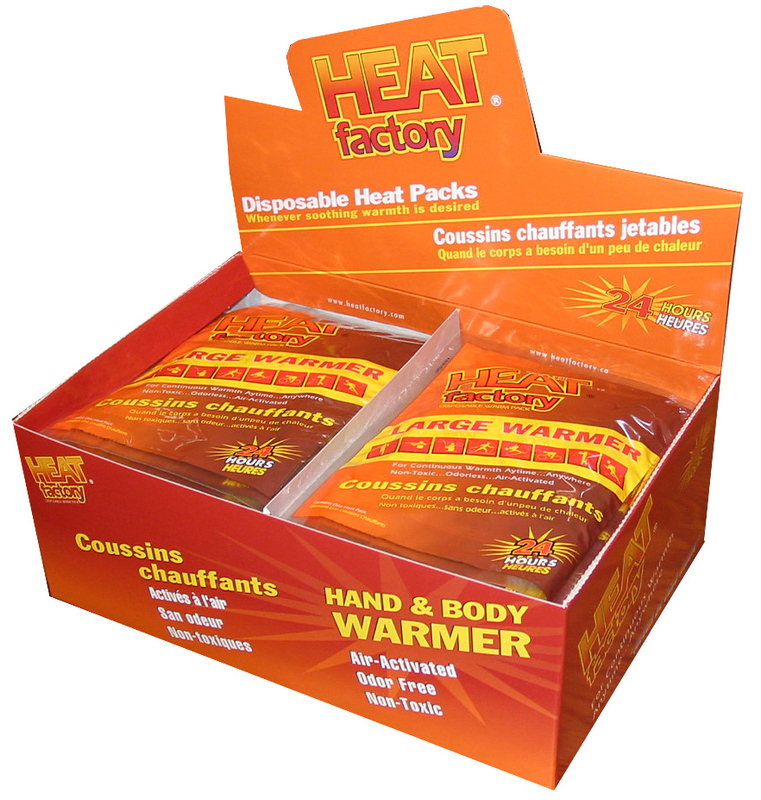 Heat Factory’s Large Warmer chipboard display box (1941) can be shelf displayed, used as a Point of Purchase display (POP), or used to fill many Heat Factory displays. Place the display in additional locations throughout the store or group the display with other Heat Factory products to create a Heat Center™. 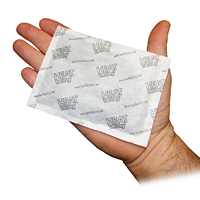 All Heat Factory packaging is consistent with colors the consumer has come to associate with Heat Factory’s quality products. Each display box contains 30 Large Warmers. The Hand & Body Warmer Pack™ (1964-2) is perfect for merchandising around the store with your outerwear and camping gear, at your cash register, or in Heat Factory Dump Displays. 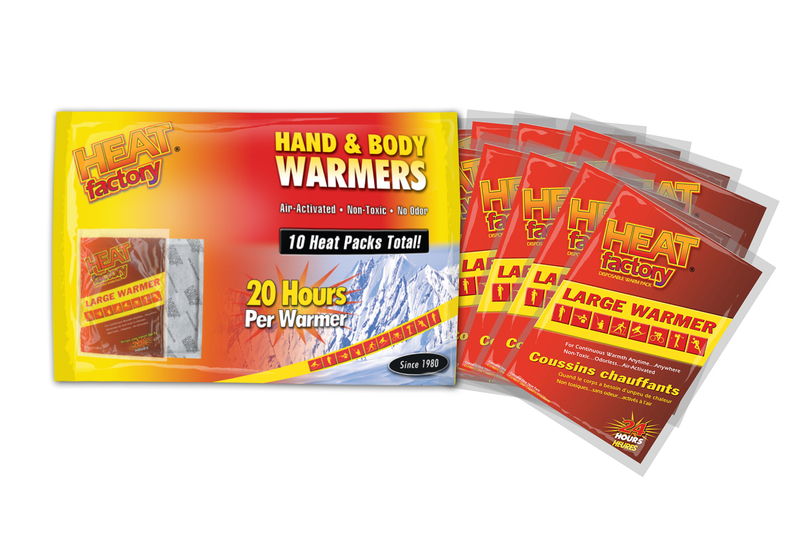 Ideal for sleeping bags and coat pockets, The Hand & Body Warmer Pack™ contains 10 Large Body Warmers. The Big Pack is available in a gorgeous display box that contains 12 Big Packs per box. Our Large Warmer Multi-packs (19413) provide value and convenience to the consumers while adding increased sales volume to retailers. Each tray comes in its own 200# corrugated shipper and a separate clip strip, making it an excellent choice for central warehousing. One SKU provides many purposes: a self contained POP shelf display, a peg hang, or it can be used to refill other Heat Factory displays. There are three Large Warmers per multi-pack and 10 multi-packs per tray. The Large Warmer Clip Strip (19413-C) includes twelve multi-packs of Heat Factory Large Warmers pre-clipped for your convenience. Place clip strips throughout the store and near Heat Factory accessories for maximum exposure and sales. This is the ideal option for stores that prefer pre-hung clip strips without trays. Orders must be in box quantities (48); minimum orders of 12 boxes per shipment are required. Heat Factory offers not only great products, but also more merchandising displays, materials, and signs that any other supplier in the industry. We realize that our role doesn’t just stop at making great products. It continues on into the marketing and merchandising of said products. Heat Factory offers countless merchandising options that we’ve produced in an effort to help you meet your profit and unit turn goals. Take a look at Heat Factory’s merchandising opportunities for ideas.